Sassafras is one of those rich childhood memories that I savor and crave from time to time. Rich is the aroma, flavor, and the memory my mother’s love and attention. When the world around me was not just right, my mother Alice would brew me a cup of healing “sassafras tea.” Her mother brewed it and her mother before her brewed it. Just knowing that Alice had stopped everything she was doing to sit with “just” me in the kitchen, was probably the most medicinal part of my “sassafras tea” experiences. 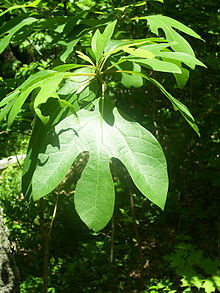 Sassafras is native in our “neck of the woods.” The Boston Mountains are alive with sassafras trees. In the Spring, the native American Cherokee tribe steeped the roots to make a drink they felt helped cleanse and purify the blood. They used it as a remedy for diarrhea and for those they thought were a bit “too fat.” They also knew using it for a prolonged period of time could become counterproductive and make you ill.
As a chef I know the wonderful use of the dried leaves. I naturally use them to thicken my gumbos. The thickening action of the ground, dried leaves [file’ gumbo] has a slippery texture different than using corn starch or flour. There is a subtle flavor that the Cajun folk crave like I crave a cup of the tea. This entry was posted in Herb and tagged Boston Mountains, Cajun, Native Americans in the United States, Root beer, Sassafras. Bookmark the permalink. Wow! The FDA and the DEA and Health Canada, and the EU banning herbal remedies keeps the big Pharma companies going. Was very interested to read about Sassafras – both that it’s good for people who are little bit too fat and also for thickening. Will see if I can find some here.